Hundreds of jobs have been created in Bosnia and Herzegovina after a Russian oil company, Zarubezhneft, bought out the Brod oil refinery in the Republic of Serpska in Bosnia and Herzegovina. Brod is one of the largest oil refineries in the Balkans. It’s now owned by Russians, along with two other refineries in the Republic of Srpska. Zarubezhneft bought the refinery for $ U.S. 1.3 BLN. 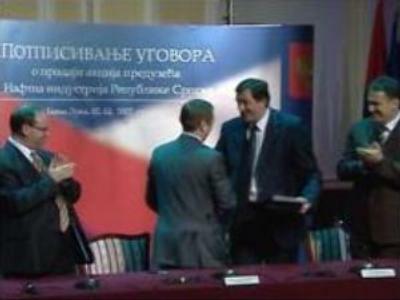 Local authorities say they preferred the Russian offer because of historical ties and energy prospects for the future. “Russia has a huge energy potential, and we’ve always had a good relationship, friendship among the Serbs and the Russians. And we can’t forget the ”Druzhba“ oil pipeline goes through the Brod refinery,” stressed Milan Jelic, president of Republic of Srpska. Local papers say the deal is a historic one for the Republic. And financial experts agree the Brod refinery has great potential. The takeover means the refinery will provide some 1,500 jobs, making it once again one of the most powerful enterprises in the region. And later this year more Russian companies are expected to invest in the Republic’s economy.